The Topper World Championships 2017 concluded last Friday evening in Loctudy, France after a great week of racing. Over 210 competitors from France, Ireland, Scotland, Wales, England, China, Macau and South Africa took part in the opening ceremony on Sunday evening 23rd of July. Racing started on Monday with a very civilised FG time of 1355. The two fleets – 4.2 and 5.3 got a full qualifying series completed of 9 races over the first three days. The fleets were then split into gold, silver and bronze respectively. As we had no 4.2 fleet competitors all focus was on the 5.3 fleet, where 156 sailors were battling it out. 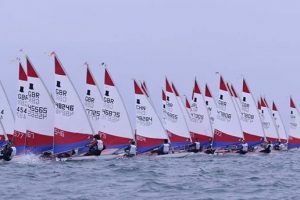 The weather was grey and misty for much of the week with shifty conditions and strong tides keeping all competitors on their toes. 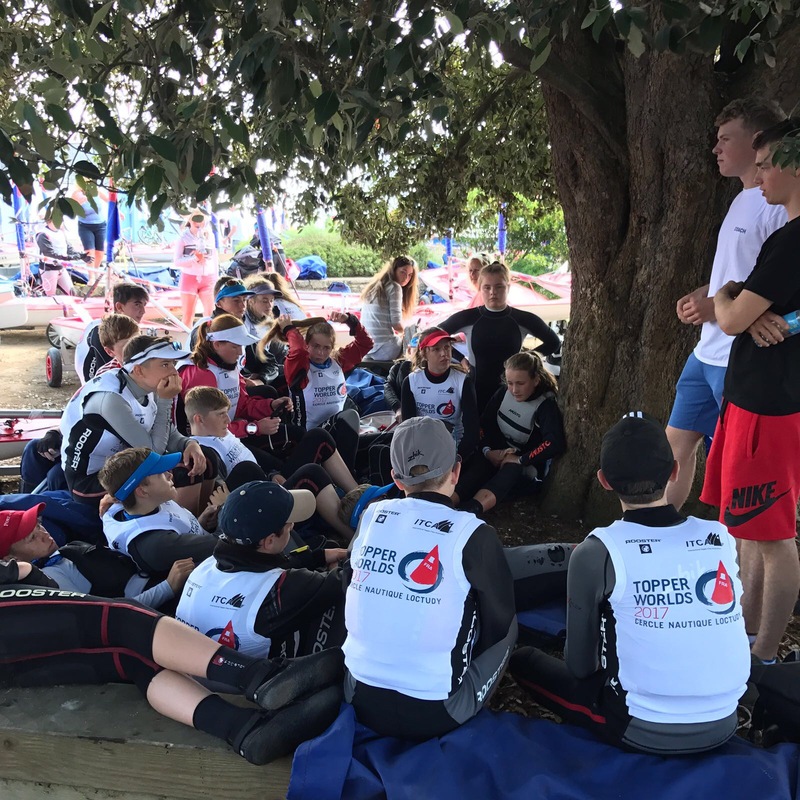 Coaches Dougie Power and Adam D’Arcy kept the minds focussed with daily briefings and on the water support and some DJ’ing by night in the Team RCYC house!. Meanwhile Brian Jones and I ran the running repairs with a daily list of “fixes” completed before racing each day. 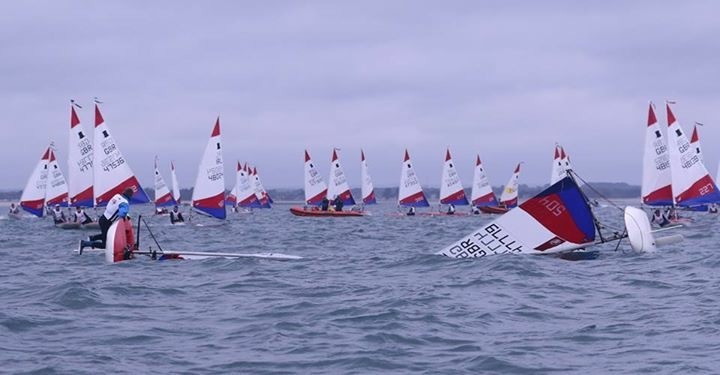 When sailing concluded on Friday we had Gold Fleet/Overall – 8th Rob Keal, 14th Conor Horgan, 22nd Jonathan O’Shaughnessy, 33rd David Jones, 35th Jack O’Sullivan, 48th Dorothy Matthews and rounded out with Aoife Byrne in 52nd. 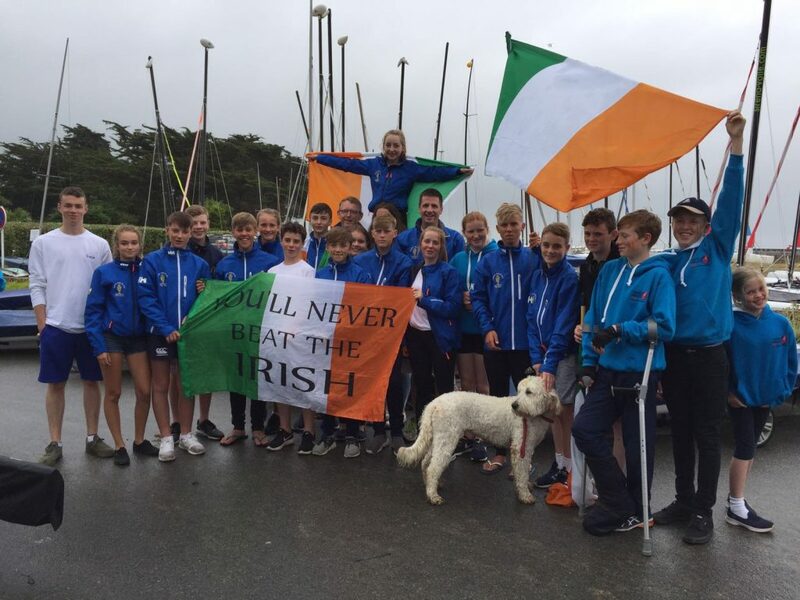 Silver Fleet – 4th/56th Ciaran Ryan, 5th/57th Kate Fahy, 10th/62nd Adam Power, 79th Kate D’Arcy, 84th Ellie Cunnane and 94th Hugh Lynch. Well done also to our other first time Worlds competitors Emma O’Sullivan and Diarmaid Desmond who competed in Bronze Fleet. Whilst the racing took centre stage there was also lots of fun had at China night, opening and closing ceremonies, visit to Decathlon on the way to the ferry in Cherbourg, Team Ireland BBQ hosted by Brian and I to mention a few!. Thank you to all the parents that assisted on Tuesday for Team Ireland Duty Day and provided RIB cover, trolley repair duties, sailor minding etc throughout the week. Next year’s Worlds are in China and information re qualifying criteria for grants and the necessary application forms can be found on the ITCA World website here. There will be 100 international competitors given grants but there are deadlines around flights etc, so be sure to apply early if you are interested in travelling.